A few weeks ago, I shared how my 15 year old son Joel recently got his driving permit. Boy, has that been an adjustment to make! I’m not even quite sure how we got to this point. Honestly, it feels like he should be only 5 or 6 years old at most, not driving age already. When Joel was a newborn, I couldn’t see past his sweet fuzzy head. He was completely dependent on me for food, clothes, diaper changes, entertainment. As I lay in the hospital bed holding my newborn son, I couldn’t even fathom him learning to crawl, much less drive a car. But it really didn’t take all that long for him to grow. Suddenly, here I am with a boy who towers over me and chauffeurs me all over town. Not only does it feel as if he shouldn’t be this old, but it feels like I shouldn’t be this old either! Sometimes in this life we can’t make out anything other than what we can see. Life’s like that, isn’t it? We can’t see the future because the present and the past are all the we know. Right now whenever I think of those rambunctious foster toddlers, I can’t imagine that someday they will be able to sit still through an entire picture book, much less a full-length movie or a college lecture or a Sunday morning sermon. The present is just far too real for me to look into the future with any sort of reality. It’s been a little over a year since my father passed away. Sometimes I try to envision him in heaven, in his new glorified body worshipping Jesus. I cannot fathom it. Then I try to put myself there and find it’s even harder to visualize. And yet, I know it’s the truth. 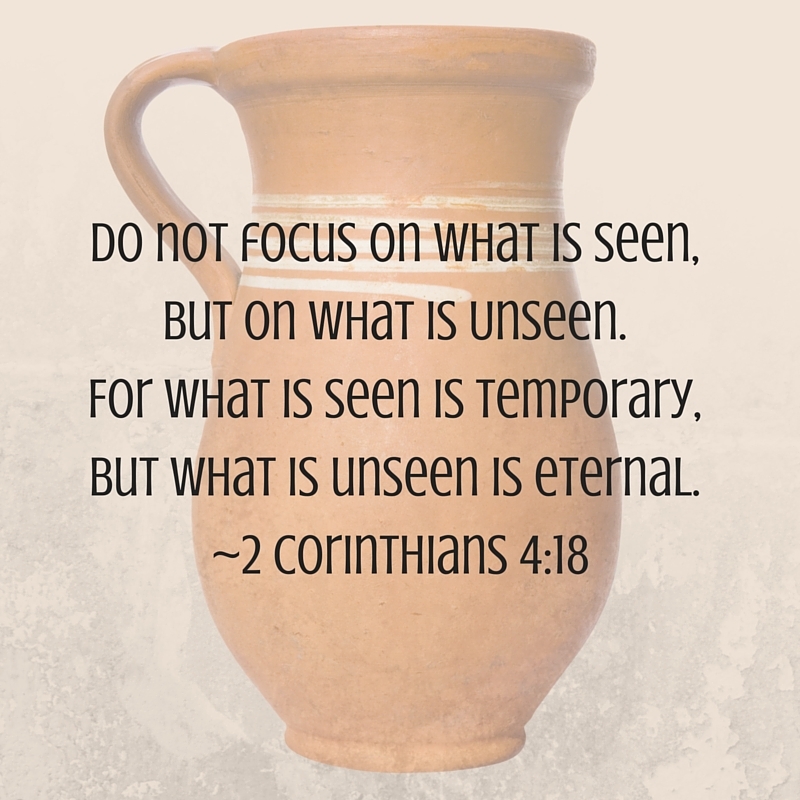 The Apostle Paul writes in 2 Corinthians that we are like clay jars with a treasure inside. That treasure is the power of God. Our humanness makes us lowly, but because of His power in us, we can be pressured, persecuted, perplexed, or struck down by life’s trials and not be broken. Nothing, not even death, can stop the power of God. With God in us, we are more than a humble clay jar., more than what the world sees when they look at us. This earthly life is just temporary. What we know and experience is God’s power in us so that we don’t shatter under the pressures of life. Through Christ, we are more than conquerors. And that, is an eternal gift that will last forever. 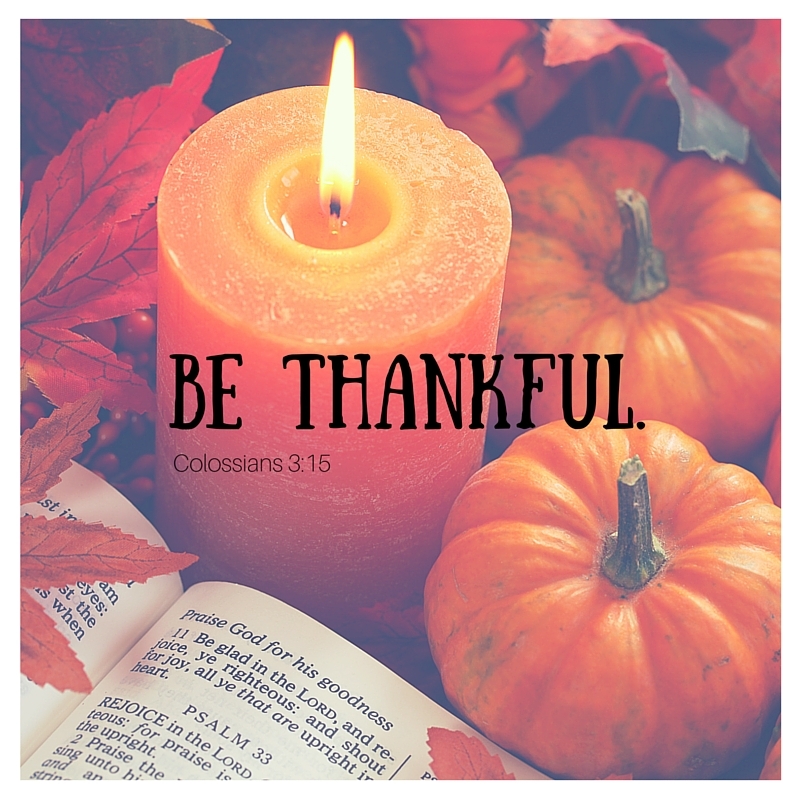 I’m thankful for the unseen. Praise God for His glory which will never end!